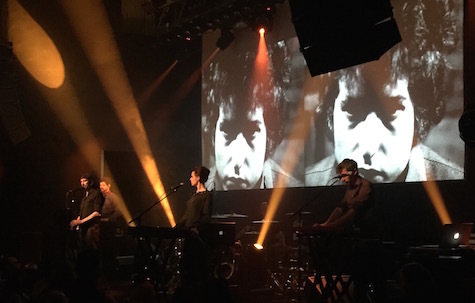 Laibach during their cover of Dylan’s “Ballad of a Thin Man,” at Slowdown, May 22, 2015. Small but boisterous crowd for Laibach last night at The Slowdown. Maybe 125 (pure guestimate) was on hand to see the Slavic titans put on their unique, goth version of a post-industrial dance party. The entire production was well-constructed. I wouldn’t call what they played last night “Industrial” as much as art-synth rock with an accent. There were elements that sounded like the band was parodying a Cold War East German synth band when in fact this was the real thing, taken to a modern world where The Wall has been torn down for decades and the only thing to rant against is capitalism, in an “Occupy” sort of way. The band consisted of three synths, a drummer and two vocalists, chief of which was the gravel-voiced Milan Fras, who I’m told (by the fan sitting next to me last night) sounded exactly like he did in the ’80s. Countering his growl was the Enya-esque singing of Mina Špiler. My pal said the band seemed like a kinder, gentler, modern version of the Industrial band he remembered from his youth. There were times during the second of two sets (complete with intermission) that their music sounded like a Euro-synth dance party, sort of a cross between Depeche Mode and The Faint, but with more growling. Not to say that’s a bad thing. Add the dramatic staging and you’re getting your $25 worth — digital klieg lights beamed across the Slowdown’s empty balcony like WWII search lights, while images flashed on the screen behind the band — sometimes like Mac screen savers, other times showing clips from what looked like a German science fiction film complete with flying saucers emblazoned with swastikas, a sort of Battlestar Galactica fascist nightmare vision, which was actually pretty cool if not disturbing. The best moments were the symphonic-style movements from the first set (again, very Enya), the cover of Bob Dylan’s “Ballad of a Thin Man,” and the encore, which was sung in a foreign language. These foreign-language songs were the most powerful, maybe because they were the most mysterious and — combined with the goth-synth music — the most disturbing. We add our own meaning when the language isn’t English, inescapably haunting and filled with post-apocalyptic dread. Well, one assumes there will be nothing dreadful about what’s happening at The Waiting Room and Reverb this weekend. The One Percent clubs are hosting the 3rd Annual Crom Comedy Fest Friday through Sunday nights. Says comedian Mike Perry, “The festival is locally produced and was started by OK Party Comedy, a local collective created to give Omaha an option that isn’t a corporate comedy club with drink minimums and hacky jokes.” You be the judge regarding hackiness. Pricing and line-up vary from club to club. Go to cromcomedyfest.com for more info. Needless to say, it puts a hole in the musical calendar, though there’s still plenty going on. The Barley Street has a full slate tonight, headlined by Strange Attractors with Kerry Eddy and The Current Situation and Scott Severin. $5, 9 p.m.
It’s another all-local showcase tonight at fabulous O’Leaver’s with Charlotte Sometimes, Kait Berreckman and The Ronnys. $5, 9:30 p.m. The weekend’s big show is Saturday night at The Slowdown — the return of Built to Spill. The band is on the road supporting Untethered Moon (Warner Bros, 2015) their first studio album since 2009. Also on the bill are Wooden Indian Burial Ground and Clarke and the Himselfs. $20, 9 p.m.
Also Saturday night, 4ontheFloor headlines a show at O’Leaver’s with Clarence Tilton and The Sons of O’Leaver’s. $5, 9:30 p.m.
And that’s what I got for this weekend. If I missed your show, put it in the comments section. Have a great Memorial Day weekend. 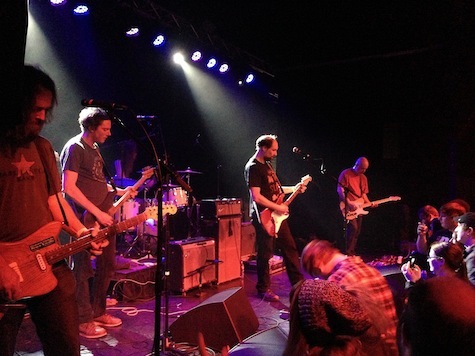 Built to Spill at The Waiting Room, Oct. 18, 2013. In fact, last week’s nearly sold-out show edged its way to the top of my list of Omaha B2S shows. Doug Martsch and company played a sharp, measured set that combined the best songs from his classic albums with heavy stuff from the band’s latest. Martsch was in particularly good voice (Is it me or is his voice getting higher as he gets older?) and the band was tight as a tic. The best part, there were virtually no extended jams or drawn-out noodling like we got the last couple times B2S came through town. Instead, it was bam-bam-bam from song to song. The full setlist is here. Lee Ranaldo and the Dust at The Waiting Room, Oct. 18, 2013. Just as solid was the opening set by Lee Ranaldo and The Dust. Like I said last week, this is as close as you’re going to get to Sonic Youth around here (including Steve Shelley on drums as a member of The Dust). Ranaldo’s music is akin to the more melodic, psychedelic stuff from SY, and featured some amazing guitar solos held together with a tight rhythm section. Gorgeous, dense rock songs, beautifully played. If you haven’t already, seek out Ranaldo’s solo stuff on Matador. Rock band Electric Chamber Orchestra (members of Gus & Call and McCarthy Trenching) is playing a set tonight at Pageturners. It’s a warm-up of sorts for a brief Boston tour the band is launching this Thursday. Actually, the band will be providing the “thematic accompaniment” to a couple Boston performances of Mac Wellman’s Wu World Woo. One problem: The band needs cash for air fare, gas, food and lodging. That’s why they’ve launched an Indiegogo page to raise money to support the tour (Indiegogo is just like Kickstarter). The premiums are pretty sweet, and include McCarthy Trenching vinyl and unreleased Gus & Call material. Get in the action NOW — There’s less than 48 hours left in the campaign. Also tonight (and I don’t know how it sneaked up on me, I swear I didn’t see it on the One Percent Productions calendar before last week) FUZZ plays at The Waiting Room with CCR Headcleaner. FUZZ is Ty Segall and Charlie Moothart (of Ty Segall’s band). They’re touring in support of their self-titled debut album (out now on In The Red), which is amazing. This ain’t a Ty Segall concert per se, but it’s just as good. $10, 9 p.m. Whenever discussing Built to Spill with anyone who remember the Sokol Underground days, the band’s smoky 1999 show inevitably comes up, the one where Dave Foley and Lea Thompson — both cripplingly inebriated — were hanging all over people in the crowd. 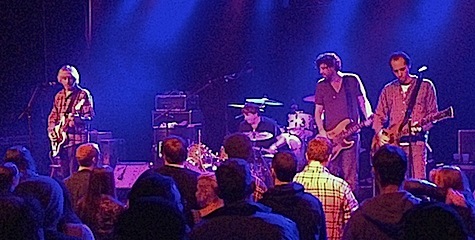 That show is described in this 2007 interview with frontman Doug Martsch, a story set up by this seminal question: Which version of Built to Spill will show up for the concert — the poppy version or the jam-band version? That same question applies to tonight’s show at The Waiting Room, though I have a feeling I already know the answer. The last two times I saw Built to Spill (that 2007 show and the Slowdown’s outdoor parking-lot gig (and why doesn’t SD do those outdoor gigs anymore?)) both were very jam-heavy affairs, with songs that featured long, drawn-out Martsch guitar solos. B2S is still touring on 2009’s There Is No Enemy, the same album they were promoting at that outdoor Slowdown gig. But just as much of a draw as Built to Spill tonight is the opener, Sonic Youth guitarist Lee Ranaldo and his band, the Dust. His new Matador release, Last Night On Earth, has that same trippy style that SY’s slower grinders are known for. If you’ve heard Thurston or Kim’s latest efforts, you already know that this is the closest thing you’re going to get to Sonic Youth other than Noah’s Ark Was a Spaceship. Opening is fellow PWN band Slam Dunk. $22, 9 p.m.
That’s not the only thing going on tonight. House of Loom is hosting a very cool indie/garage show featuring PNW band Chastity Belt. The band’s latest album, No Regrets, carries on the spirit of ’90s college indie (i.e. early Liz Phair, etc.) and is pretty fantastic. Also on the bill is Seattle garage duo Pony Time (Per Se Records). The show is being promoted as a costume thing, which will keep me away, but shouldn’t keep you away, especially since it’s only $7. Starts at 10. More info here. Also tonight, Phantom Scout plays at O’Leaver’s with Portland band Genders and local boys Let Alone making their stage debut. $5, 9:30 p.m.
And of course Lincoln Calling is in full swing all weekend. Get the full schedule before you head to the Star City from Lincoln Calling website. Tomorrow night’s pretty busy, too. Pro-Magnum headlines a punk show over at The Brothers Lounge with The Bugs. $5, 9 p.m.
Over at fabulous O’Leaver’s Oquoa returns with Water Liars. $5, 9:30 p.m.
Down at Slowdown Jr. Skypiper headlines a show with The Kickback and Canby. $7, 9 p.m.
And don’t forget the Almost Music grand opening celebration Saturday at 7 with in-store performances by Simon Joyner and Noah Sterba of The Yuppies. It starts at 7 p.m. and is free, though you’ll probably part with some ducats when you see the store’s selection of fine vinyl. That’s all I got for the weekend. If I left anything out, put it in the Comments section. Have good one. 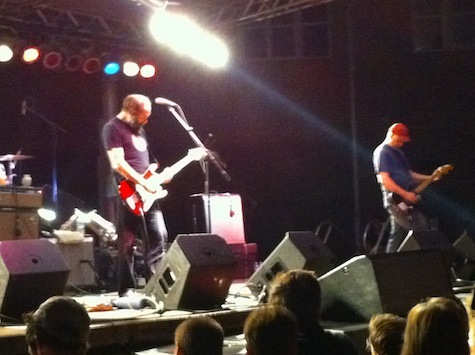 Built to Spill performs at Slowdown Aug. 27 under the watchful gaze of their sponsor. Live Review: Built to Spill, She & Him. The best thing about outdoor concerts: Even if you can’t stand a single note of the music, all you have to do is look up, overhead, and there’s something worth seeing. Of course that wasn’t necessary this past weekend at two of the summer’s most anticipated indie concerts, both held under the black ocean of night, lit only by streetlight, stage light, star light and eventually, moonlight. 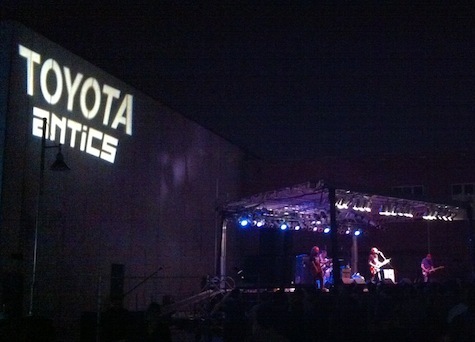 In the case of the Slowdown Block Party — held in the venue’s parking lot Friday night — there also was advertising light in the form of massive stenciled floods that blared “TOYOTA aNTiCS” — the primary event sponsor and the reason you didn’t need to pay to get into the show. Parked throughout the lot was Toyota’s line of economy cars “tricked out” to make the young, ultra-hip audience covet them. It’s all about demographics, my friend, which we would hear more about from stage later. In this era when the dying shell of the music industry continues to decay before our very eyes, it’s sponsors like Toyota that are helping prop up the carcass. There was a time when bands and their fans would consider such blatant commercial “opportunities” as “selling out” — an inexcusable crossing of the line between art and commerce. In the old days (just 10 years ago) any respectable indie band would have taken one look at that aNTiCS sign, packed up its gear and left. But these days gigantic sponsor banners are the norm at music festivals, while most indie bands would kill their publicist and/or booking agent just for a chance to get their music used in a Toyota commercial. Selling out, it seems, is just good business. When I joined the crowd of around 2,000 just after 9 p.m., The Mynabirds were finishing their set as the last remnants of daylight waned. Laura Burhenn’s band sported a new cello player tucked neatly behind the front-stage vocalists. As is the case with almost every cello I’ve seen at a rock show, you could barely hear it except at the quietest moments. There was a time when it seemed like every indie band was trying to work a cello into its line-up, including noise-makers like Cursive. But slowly they all got the drift, and cellos began to disappear. Until now. A stroll around the grounds between sets revealed beer tents, food tents and merch tents mingled among the little Toyotas. You don’t realize the enormity of Slowdown’s parking lot until you’re at this kind of event. It easily could hold a few thousand more music — or sports — fans. In the shadow of the half-constructed TD Ameritrade Park, imagine all the money that will be rolling in during the College World Series next spring, and every spring thereafter. Enough money to “make their year” and allow Slowdown to host more concerts like this one, but without the tacky sponsors. The Mynabirds were followed by another Saddle Creek band, The Rural Alberta Advantage, whose dusty backbeat hoedown fare makes them a strange fit for the label (though their new material sounded promising). Finally, on came Doug Martsch and Built to Spill. With his stringy hair and big, crazy graying beard, Martsch looked like he just walked out of a survivalist compound. Tough his Neil Young-meets-Kermit the Frog voice can’t hit the high notes on crowd faves like “Time Trap,” Martsch can still shred like few others in the indie world. And when joined by two other axemen, Built to Spill becomes a Fender-powered rocket at lift-off. Too often, however, the songs turned into extended jam sessions — great stuff if you’re a guitar enthusiast, boring for anyone else. It was between jams that guitarist Brett Netson let loose on the night’s sponsor, angrily warning the crowd that they had been defined as “a demographic.” “I wonder who’s sponsoring this show,” Netson snarled. “What kind of car do you want to buy? A used one.” Hope they got paid up front. The following night outside along the river a different kind of star took the stage at The Anchor Inn. It was movie star Zooey Deschanel — the she in She & Him — who’s had her own fling with selling out, acting in a TV commercial where she sings about how Cotton is the “fabric of my life”– a jingle that would fit comfortably on the latest She & Him album. 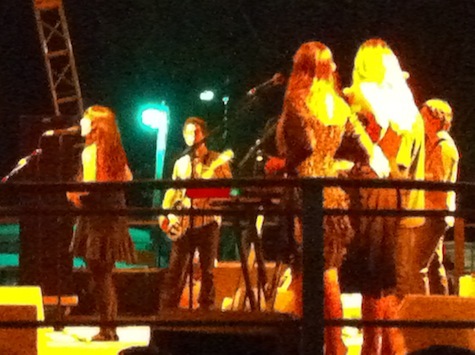 Fortunately, Zooey didn’t sing about her love for natural fibers Saturday night. Instead, she and M. Ward (“Him”) played a selection from their two Merge records. Deschanel indeed has a sweet voice. But you wonder if she would be singing in front of 1,600 people if not for her film career. At its best, her voice is second-round American idol pitchy, especially on an ill-conceived Beach Boys cover. Still, Deschanel and Ward are smart for taking on a retro ’60s girl-group pop style that’s both musically and lyrically risk free. But while Ward and the entire band are talented, there was something strangely inauthentic about their retro sound in a way that only a freed Phil Spector could decipher. The crowd of mostly women, however, could have cared less about authenticity as they drank their watermelons and bobbed their heads to the milquetoast beat, while the rest of us leaned back on the banks of the Missouri River and looked up as a burnt orange new moon slowly rose in the northeastern sky. A terrible summer head cold kept me away from The Waiting Room last night for Crooning for Kat — figured I shouldn’t ruin everyone’s night by infecting them with my pestilence. I hope all of Greater Omaha made it out, and that Kat’s quickly on her way back to good health. I bet the hot topic of conversation last night at TWR (other than Kat) was the Omaha City Council yesterday rejecting the request by CVS Pharmacy to build a new store at 49th and Dodge, the current location of The 49’r (story & video here). So I guess that means The 49’r will live on, right? Right? Did Mark Samuelson, who owns the Niner, hope to put the bar to bed? One would assume so, since CVS couldn’t have developed the property unless Samuelson wanted to sell it. Looks like he’s lost his buyer, which also makes one assume that The 49’r will indeed live on… until Samuelson finds another buyer. Tonight at The Waiting Room it’s Capgun Coup with Conchance featuring Black Johnny Quest, and Dojorok and Kethro. $5, 9 p.m. Meanwhile, down at Slowdown Jr., it’s the return of Poison Control Center with Talking Mountain. $7, 9 p.m. Built to Spill at The Slowdown Block Party, Aug. 27, 2010. The full review of this weekend’s outdoor shows — the Slowdown Block Party and She & Him at The Anchor Inn — will be online as this week’s column on Wednesday. Until then, here is a selection of photos taken at the shows. 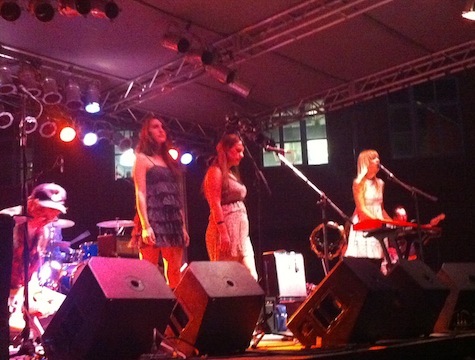 The Mynabirds at The Slowdown Block Party, Aug. 27, 2010. 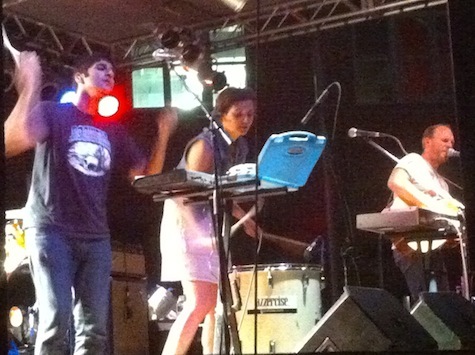 The Rural Alberta Advantage at The Slowdown Block Party, Aug. 27, 2010. She & Him at The Anchor Inn, Aug. 28, 2010. Update: The Seafarer Kickstarter project met its $3,500 fund-raising goal. Shooting for the film, that will include music by local bands, will begin in the next couple of weeks. More info about the film is available at seafarerfilm.com. Envy Corp drummer Scott Yoshimura’s side project, Canby, is playing tonight at The Waiting Room. Opening is Skypiper and Pictures of Then. $7, 9 p.m.
Also tonight, Ember Schrag will be performing at the Bemis Center for Contemporary Art, Gallery 2, along with Baltimore’s Daniel Higgs, The Chiara String Quartet and Carnal Torpor. $6 members, $8 non-members. Doors open at 7. Hailing from Lawrence, Kansas, Cowboy Indian Bear have played in Omaha regularly over the past couple of years, usually down at Slowdown, though they’ve done the full circuit (TWR, O’Leaver’s, etc.). You say you like four-part harmony? How about solid bass lines? What about brawny, thick-beat drums augmented by electronic beats? CIB has it all, along with gorgeous melodies that lean toward the sweeter side of indie pop — think Spoon or upbeat DCFC or Broken Social Scene. Their strength really lies in their vocals — all four members can sing well, including a new female band member whose voice falls somewhere in the Harriet Wheeler (The Sundays) wheelhouse. Their sound is cleanly, crisply captured on their new album, Each Other All the Time, which came out earlier this year and is worth seeking out if you’re looking for a cool, laid-back summer album. After CIB came Landing on the Moon, but not until around 11:30. I made it through four songs, including what’s become their set highlight, “California,” before I gave up the ghost for the evening. Alas, I missed LBS one last time, though you can catch them tonight for what really is their final show, at The Zoo Bar in Lincoln with Cowboy Indian Bear and High Art (Darren Keen and Co.). Reminder: You’ve only got a couple days left if you want to help finance the Seafarer film project via Kickstarter. The locally produced project will feature music from local bands (most likely including Honeybee and Capgun Coup). The project goal is $3,500, and pledges currently stand at $3,065. A pledge of $15 or more will get you some nice goodies along with the knowledge that you helped make the project a reality. Check it out. It’s fitting that as summer winds down there are two marquee outdoor shows happening this weekend. The highlight is tonight at Slowdown’s parking lot, the site of what’s being called the “Omaha Block Party,” featuring Built To Spill, The Rural Alberta Advantage, and The Mynabirds. If it’s anything like last year’s outdoor bash at Slowdown (that featured Azure Ray and Cursive, among others) it will have a sort of festival vibe. The best part, of course, is that it’s free, but you’ve got to go to this website and print out an RSVP ticket. Door opens at 7, and the show starts at 8:30. No idea where you’re supposed to park other than on the streets around Slowdown. Then tomorrow night, She & Him are playing at The Anchor Inn with The Chapin Sisters. I have no idea if the Inn is still suffering from flooding. Regardless, there will be a stage set up somewhere on the grounds. If you haven’t been out there for a show, you’re in for a treat. $20, 9 p.m.
That’s not all that’s happening this weekend. Tonight is the last show of the summer at Lincoln’s Clawfoot House. Ember Schrag, who runs Clawfoot with Brian Day, said they are turning over the venue to a young artist/musician couple who will be moving in and taking over as of Sept. 1, with a grand reopening Sept. 30 with Pillars and Tongues from Chicago and FATHR^. Those projects include a two-and-a-half month U.S. tour that starts next week, but that really kicks off at tonight’s show, which is a “casual fundraiser to help with a few tour expenses.” It’s at Clawfoot House, 1042 F St., and includes a spaghetti dinner, indoor garage sale, tarot card readings, four bands and a video/sound performance. It’s a $6 cover, $3 for the dinner. The event starts at 6 and music starts at 9 with Ron Wax (featuring Ron Albertson of Mercy Rule), Ed Gray (Iowa City), Ember Schrag and her band, and Tiny Tiny Tongues. Meanwhile, tonight back here in Omaha, The Ground Tyrants are headlining a show at the Barley Street Tavern with All Young Girls Are Machine Guns. $5, 9 p.m.
Saturday has Lincoln band Wastoid playing at The Brothers Lounge with opener Ron Wax (featuring Ron Albertson of Mercy Rule) and The Lepers. $5, 10 p.m.
Also Saturday night, Ketchup and Mustard Gas are at O’Leaver’s with Birthday Suits. $5, 9:30 p.m.
And Simon Joyner is playing a house show at 4208 Mayberry Street with Ed Gray, The Prairies and Ember Schrag. Show starts at 9 and suggested donation is $5 to $10. Subscribers to The Slowdown’s weekly e-mail blast found out yesterday that the venue is hosting another free concert in their parking lot Aug. 27, this time featuring Built to Spill, The Rural Alberta Advantage and the Mynabirds. That’s a strong line-up that would have made for a great youth concert at Memorial Park (if the City still did that sort of thing). Last year’s Slowdown parking lot bash featured Cursive and Azure Ray, and was sponsored by Mutual of Omaha as part of its 100th birthday celebration. It was a good time. This year’s bash is sponsored by Filter Magazine and Toyota. So although the concert is free, you still need to RSVP at this website. After you do, a ticket — which is required for entrance — will be e-mailed to you. Slowdown also announced that it is hosting a Goo-fueled Maha Festival afterparty that apparently isn’t directly affiliated with Maha, though folks who show up with ticket stubs will get in free. As I watched (on TV) UCLA get demolished during last night’s College World Series finals, my mind wandered again to Slowdown. Its location right next to the new stadium where the CWS will be played next year makes it the best place to booze it up during the two-week event. Still, Slowdown always has had a “no sports” mentality. There are no TVs in the bar, though they’ve been known to roll some out for “events.” Will the bar/music venue retain its music focus or turn into Nike Town next June? Does that mean cover bands? I have a feeling you won’t be seeing any of the noisier Saddle Creek artists on their big stage those two weeks. “I think we will have a tent of some sort (outside), but bands inside since we already have the setup,” Kulbel wrote. “I am sure whatever we do in Year One will change in Year Two. Just need to figure out what works best.” Jason didn’t mention where they’ll be setting up the money-counting booths needed to process the huge inflow of cash pouring down on them for those two weeks. Tonight at O’Leaver’s is Lincoln punk band Machete Archive with Down with the Ship and Wichita band Zsa Zsa Ketzner. $5, 9 p.m.